Experiential learning opportunities build on knowledge gained in the classroom to enrich the student experience and prepare future leaders to shape a changing world. But, these co-curricular activities come with associated costs that can make it difficult for students to participate and compete in national opportunities. Now, the Beetner family has contributed $35,000 to create an endowment that will provide additional resources for Southern Illinois University Edwardsville School of Engineering (SOE) student organizations to continue to excel in such activities and competitions. “We want to help others reap the benefits of a great education,” said Daryl Beetner, PhD, who earned a bachelor’s in electrical engineering from SIUE in 1990. From 1997-98, he was a visiting professor in SIUE’s Department of Electrical and Computer Engineering. Daryl was inducted into the SIUE School of Engineering Hall of Fame in 2015. Daryl’s father Emmet Beetner also has a long history with SIUE, as an employee and administrator adding value in multiple roles since 1969. He retired in 2001, but remains associated with the University, working part-time as extra help at the SIUE East St. Louis Center. The SOE’s new Fowler Student Design Center offers innovative space for students to conduct hands-on activities that not only sharpen their technical skills, but also teach them about teamwork, time management, organizational skills, people and leadership skills. For more information on SIUE School of Engineering student organizations, visit siue.edu/engineering/students-life. 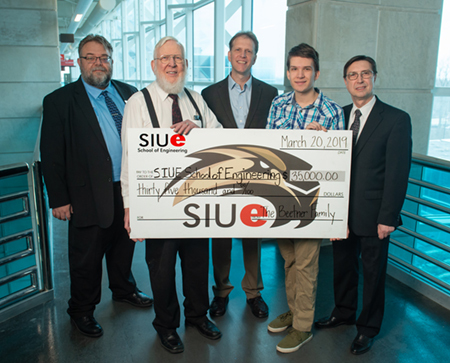 Photo: (L-R) SIUE School of Engineering (SOE) Director of Development Brian Moeller, Emmet Beetner, Daryl Beetner, freshman Andrew Schalk of the Beetner family, and SIUE SOE Dean Cem Karacal.